This quarter I return to the digestive system to talk about the gallbladder. The gallbladder is a pear-shaped organ attached to an underside (the posterioinferior surface) of the liver, and composed of three regions: the neck, body and fundus. Essentially, it is a muscular sac that serves to store, concentrate and release bile. 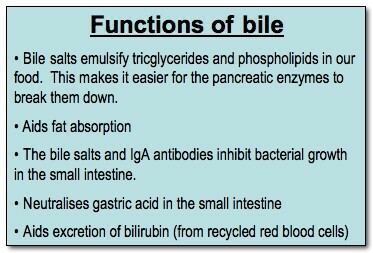 Bile is a mixture of organic and inorganic substances; including cholesterol, phospholipids, fat-emulsifying bile salts, bilirubin (conjugated with glucuronic acid to make it water-soluble), and antibodies (IgA to be precise), and it is continuously produced by the liver. The functions of bile are summarised in the blue box below. From the liver, bile travels down the common hepatic duct. The gallbladder joins with this duct by the cystic duct, which arises from the neck of the gallbladder. These two ducts join to form the common bile duct. 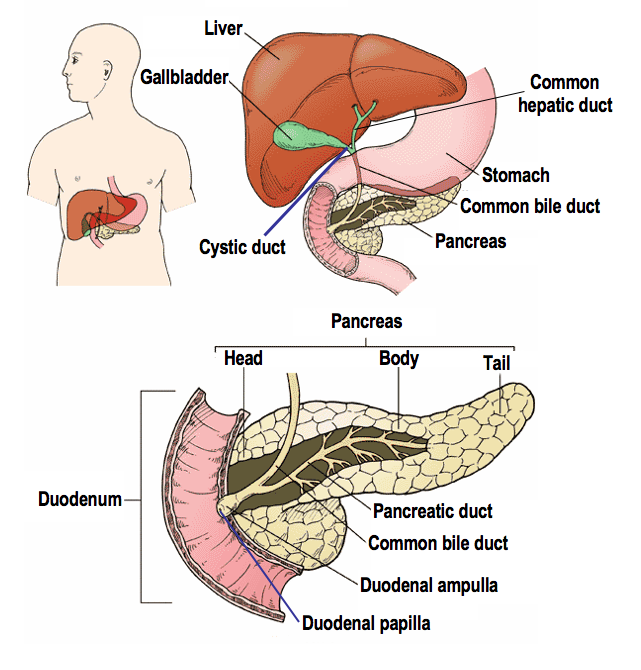 At the duodenum, the common bile duct joins with the pancreatic duct, which brings with it pancreatic enzymes and buffer. The bile then becomes mixed with these components in a chamber, a little further downstream, called the duodenal ampulla. The mix then opens into the duodenum via a small opening called the duodenal papilla. (click on the first image to view all of these more clearly). Around one litre of bile is produced by the liver each day. Its release into the duodenum, however, is controlled by the muscles of the hepatopancreatic sphincter (sphincter of Oddi), which encircle the common bile duct lumen, pancreatic duct, and duodenal ampulla. Without its stimulus, the sphincter remains contracted and the bile will not be released into the duodenum, causing a backlog. As bile production is continuous, this gives rise to the need for an overflow system. Luckily, a mechanism is in place. Any bile stores that begin to build up will enter and travel along the cystic duct towards the gallbladder where the bile will remain until released. The gallbladder is an ideal storage unit as it is expandable and can store around 40-70ml of bile when full. The gallbladder absorbs water from the bile while it is stored there, thus increasing the concentration of bile salts and other components. If bile is stored for an unusually long time, it can become too concentrated, and this can give rise to crystals of insoluble minerals and salts (more commonly known as gallstones). More often than not, they are small stones that can pass through the cystic duct, which eventually get flushed down the common bile duct and excreted. 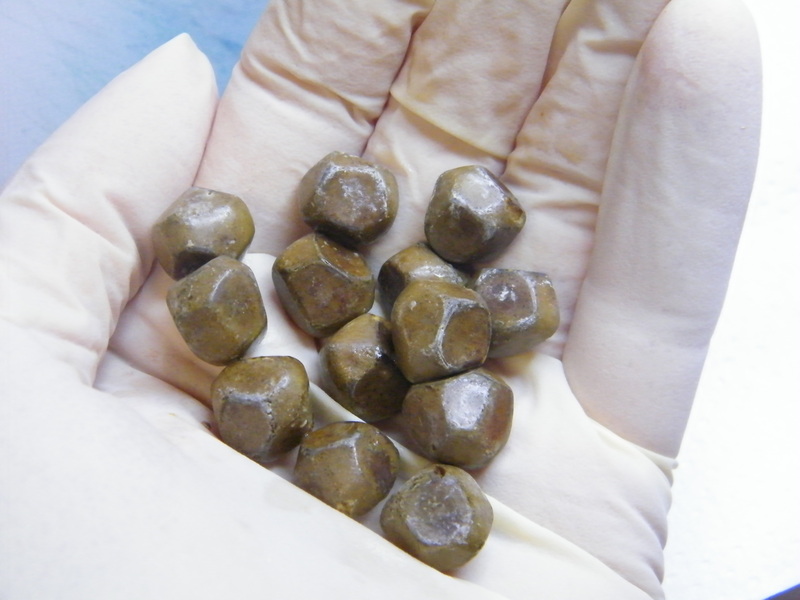 Large gallstones, resulting in cholecystectomy. Sometimes, however, much larger stones can develop. Larger stones are capable of becoming impacted in the neck of the gallbladder, thus blocking the cystic duct (and sometimes the common bile duct), causing biliary disease. They can also cause trauma to – or even cause perforation of – the gallbladder wall, which leads to other complications such as infection. For anyone suffering with larger gallstones, the best treatment is to remove the gallbladder (cholecystectomy), which can be done quite simply through keyhole surgery (laparoscopic cholecystectomy). After a cholecystectomy, the bile is a lot more dilute compared to bile that has been stored in the gallbladder, but this does not result in any major disruptions to normal digestion. The stimulus that causes the muscles of the hepatopancreatic sphincter to relax is the intestinal hormone cholecystokinin (CCK). CCK is produced by duodenal enteroendocrine cells when they become stimulated by food (now called chyme at this point) entering the duodenum. The quantity of bile that is released is dependent on the consistency of the chyme; the more fatty it is, the more bile that is released. CCK also causes the muscles in the gallbladder wall to contract, and it is also thought to have effects on the part of the central nervous system that is responsible for reducing the sensation of hunger. A H&E section showing the full thickness of a gallbladder wall. Bile is stored in the lumen. The mucosal folds produce deep clefts, and the purpose of these are to increase the surface area for absorption of water from bile. 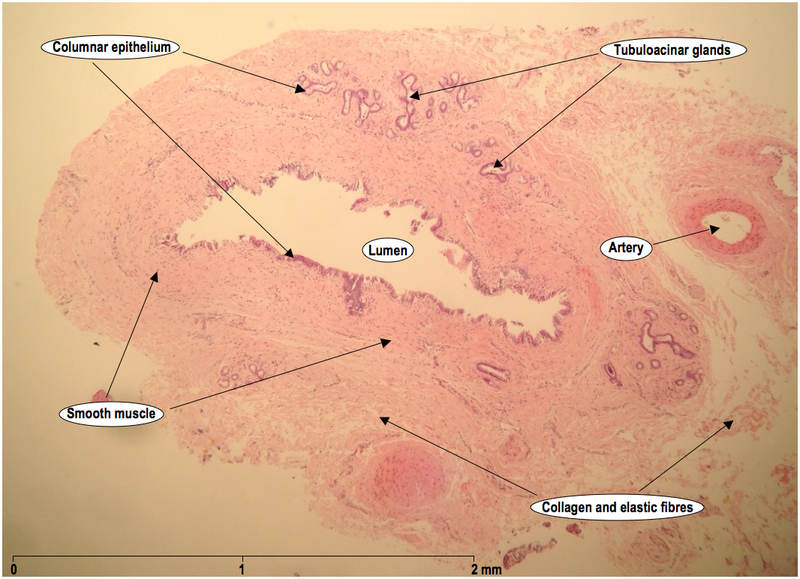 The mucosal folds are supported by a layer of loose connective tissue (the lamina propria), and, unlike the rest of the gastrointestinal tract, there is no additional layer of dense connective tissue (the submucosa) in the gallbladder. In the neck region, you may also see tubuloacinar glands in the lamina propria (shown later). The muscularis, not surprisingly, is the layer that contains those smooth muscle bundles that contract to release bile when stimulated by CCK. This layer also contains large blood vessels and a lot of collagen and elastic fibres. The final, outermost layer varies slightly depending on whether or not the cross-section is from the point where the gallbladder is attached to the liver. The portion not attached to the liver is covered by peritoneum, and so its outermost layer is known as the serosal surface. The portion that is attached to the liver is not covered with peritoneum, and its outer layer is called the adventitia. A high power H&E showing more clearly the type of epithelium that lines the mucosa. 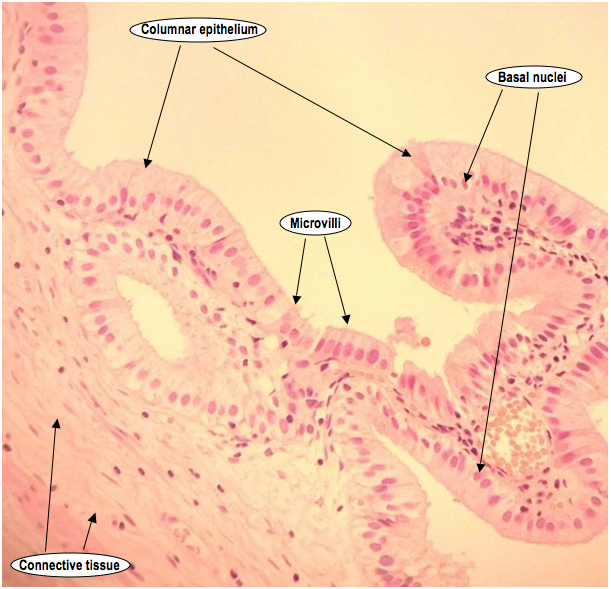 These simple columnar epithelial cells also have microvilli and basally-located nuclei. Looking closely at the photomicrograph above, you can see that the columnar epithelium have tiny hair-like structures called microvilli. These, like the mucosal folds, also increase the surface area for absorption of water. Also, as you may have noticed, all the nuclei in the columnar epithelium are arranged in a particular order; away from the lumen and towards where the cells are attached to the tissue. 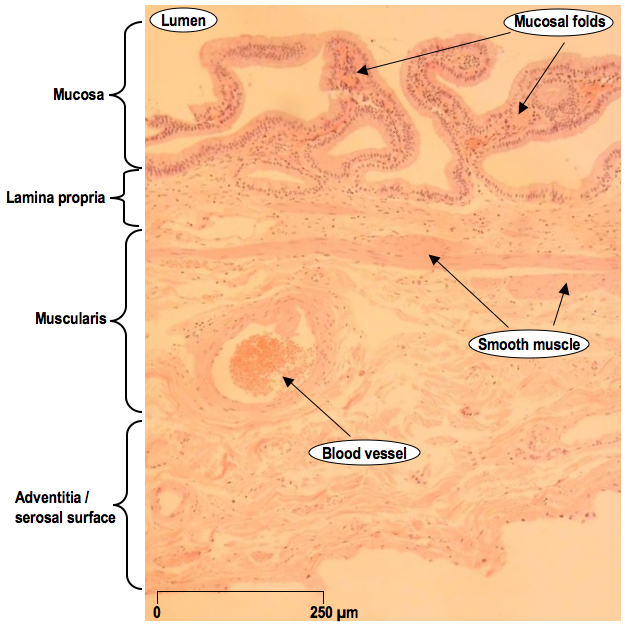 This “tissue bed” if you like, is known as the basal layer, and this is why the nuclei are given the name “basal nuclei“, which denotes their position within the cell. A low power H&E showing the opening of the cystic duct (at the neck region), together with its surrounding tissue components. 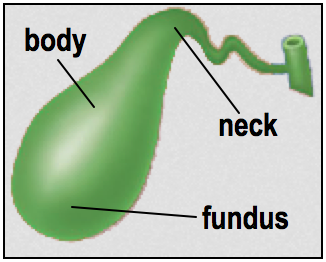 As mentioned previously, the neck region also has tubuloacinar glands (as labelled above). Also known as biliary glands, these secrete mucin, and can be found along the cystic duct and common bile duct, too. To find out more about causes of gallstones, Lap Research UK’s detailed list is a great place to start. Thank you for creating such a clear summary of the gallbladder! I’m a new histology student and found the photomicrographs especially helpful. Also, thank you for explaining the reason behind “basal nuclei”. Thanks for your comment, Sabrina, I’m really glad you found my blogpost so helpful.